François Hollande won a stunning victory, not just for himself, as a man who spent much of his career in the shadow of others, nor for France, but for the left in Europe, too. With the governing parties who preached austerity under attack from a voter revolt on Sunday – in the Greek elections, where the extreme right was set to win enough votes to enter Parliament; in Schleswig-Holstein, where the vote of Angela Merkel's coalition partners, the Free Democrats, collapsed – the breakthrough of the left in France was a huge achievement and, just maybe, a turning point. Nicolas Sarkozy is the 11th European leader to fall since the banking crisis broke and this result is more than just a shot across the bows for the former Sarkozy loyalists in Ms Merkel or David Cameron. 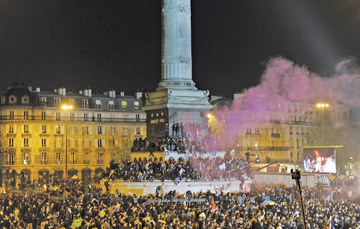 France's new direction is a mortal blow to the austerity compact which has been Europe's anchor response to the crisis. Mr Hollande is no radical. Conscious of how polarised France has become between left and right, he wanted his supporters to celebrate, not demonstrate. He has set himself just one year longer to balance France's budget than the man he defeated. But he arrives in power at that point in history where the victims of boom and bust, rather than its perennially self-satisfied authors, have become the dominant political voice. The choice France faces is a bald one. The right has failed economically as its austerity measures continue to keep much of Europe's economy bumping along the bottom. Either Mr Hollande reverses this juggernaut by creating jobs and stimulating growth in France – and his economic projections are cautious – or the far right has a field day scapegoating immigrants and central government. Protectionism and xenophobic nationalism will follow. The new French President does have a sense of history. Styling himself on François Mitterrand, the last Socialist to capture the presidency 31 years ago, Mr Hollande's date with destiny is with France, not with his party. If Nicolas Sarkozy latterly scooped up votes shamelessly from the gutter of the far right, France's next President headed consciously elsewhere: "We need everything France has got to offer," he said. He is going to need it. 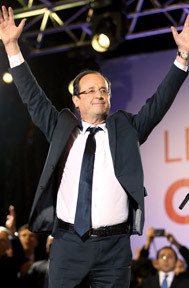 For Mr Hollande, there will be no honeymoon. Out goes a remarkable and rare figure in French politics – a one-term president. Mr Sarkozy may have lost his presidency within hours of winning it so convincingly in 2007. His decision to celebrate his victory in the poshest of eateries on the Champs-Elysees with 55 of his closest and wealthiest mates set the tone of a presidency that was always fatally flawed. Fouquet's inspired a book, its own Wikipedia entry and flash mobs of jobless which turn up to this day. Not content with one public relations blunder, the new president made another. The man that the daily Libération was to label 'bling-bling' was pictured sunning himself on a billionaire's yacht. The unconventional, mould-breaking qualities which inspired France when he was a candidate in 2007, turned off France when the same man became president. He sobered up, but never recovered from the tag that he was a president of the rich. Mr Sarkozy is right to take his defeat personally, because it was his personality that voters rejected above any other factor. The receding Sarkozy soap opera leaves his 10-year-old party, the Union for a Popular Movement (UMP), in a state of crisis. It hardly has time to recover before another electoral test comes knocking in June. The challenger will be Marine Le Pen, whose rebranded Front National could well, on the number of votes she got in the first round two weeks ago, break into Parliament for the first time since the mid-1980s. The centre-right have got no one as divisive as Mr Sarkozy, but no one as charismatic either. With the right in disarray, Mr Hollande has a rare opportunity to reshape the political landscape in a country whose default position is to the right. He will need all his steel as a leader if he is to succeed – and, one senses, not an insignificant amount of luck.